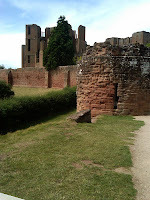 The historic wonder, Kenilworth Castle, a.k.a. "this place is soooooo boring!" Kenilworth Castle. Newly opened to the public after hundreds of freakin' years. The spot where Queen Elizabeth I was wooed by the castle's owner, Robert Dudley, who built her a fabulous guest quarters and fancy English garden. The place where my children decided they were done with castles and palaces. Done, done, and done. Phase One: Remind them that some children do not spend the summer travelling in Europe. Some children spend the summer playing in the spray of open fire hydrants. Some children spend the summer hoping to get enough to eat. Phase Three: Scream at children for possibly* eating the strawberries growing in the lovingly reproduced Queen Elizabeth Garden. Phase Four: Allow children to spend the money that they have not actually earned in the Kenilworth Castle gift shop on rubber tarantulas. Phase Five: Finally, bribe children to stay "ten more minutes" by promising them a trip to Tesco, the beloved grocery store where they can buy Flake bars. 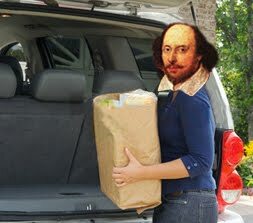 *Just in case the people who run Kenilworth Castle, the English Heritage Foundation, are reading this, I will neither confirm nor deny this incident.